When their coach finally got to the hotel, it was dark. So Ma and Pa hadn’t really taken in the neighbourhood. After breakfast then, Pa had gone to the Reception desk to ask for directions to the Pyramids. The receptionist had looked a little confused, so in the time honoured manner of the English abroad, Pa’d asked again but louder. The receptionist silently pointed at the hotel’s entrance lobby, through which Pa could see, on the opposite side of the road, the foot of a bloody great pyramid. 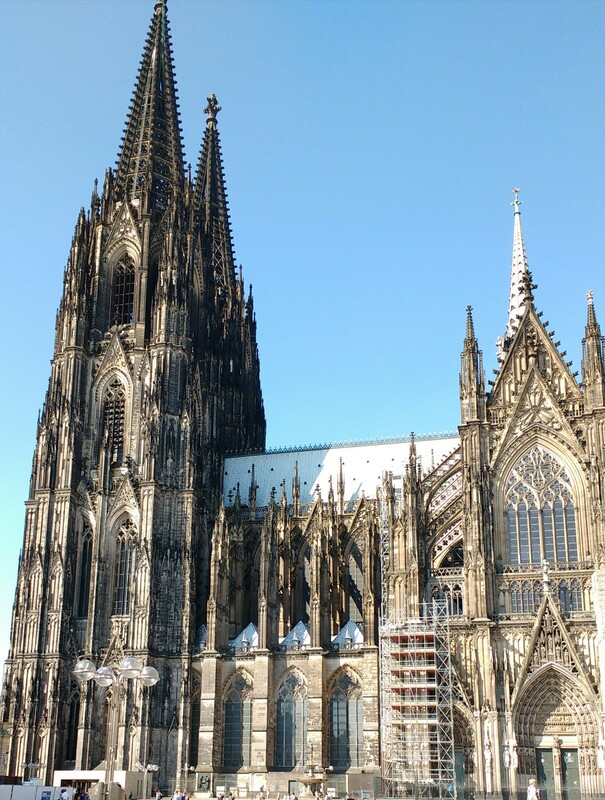 Now the one thing I knew about Cologne – or Kõln as we are now calling it, having gone native – was that it had something of a cathedral. As we left the station, I was scanning Googlemaps attempting to work out how to get to said cathedral, and in so doing I nearly bumped into this, secreted on the station forecourt. It is, the guide on the sightseeing bus told us this afternoon, the biggest cathedral in …. or it might have been church in… actually, the sun may have got to me at that point. But there’s no denying it is big. It was initially built to house the relics of the three Kings (honestly) which the Holy Roman Emporer of those time had filched from Milan. It was started in 11something then in 14 something the builders nipped off to another job, leaving their crane in place. Four hundred years later, someone twigged that the builders probably weren’t coming back. So they got another lot in, who finished the job in forty years. There’s a golden shrine inside containing the Magi’s relic but to me, it was the afternoon sun through the windows which won the day. I’d imagined that, with such a gorgeous building at its centre, Kõln would be a beautiful city. But actually, a great deal of it reminded me of Coventry and, it turns out, for the same reason. Far from its original function, the cathedral acted as a landmark to the bombers: in fact, we were told, was intentionally left intact for that purpose. So the cathedral escaped with some broken windows but 70% of Kõln was flattened. There are some attractive pockets – a small terrace of C18th merchants’ houses, sections of medieval wall, some restored churches – but these are amid lots of functional postwar buildings whipped up, as in Coventry, to provide quick housing. And a fairly ghastly ring road overpassing and under passing around the city centre. I’d love to have seen how it looked before. Our guide pointed out many, many museums and galleries including one museum dedicated to mustard and another to – though not, alas, from – chocolate. Anyway, it would have melted today. Our Airbnb is a handful of stops out from the centre and is in a pleasant area. Lots of cafes and flowers shops. 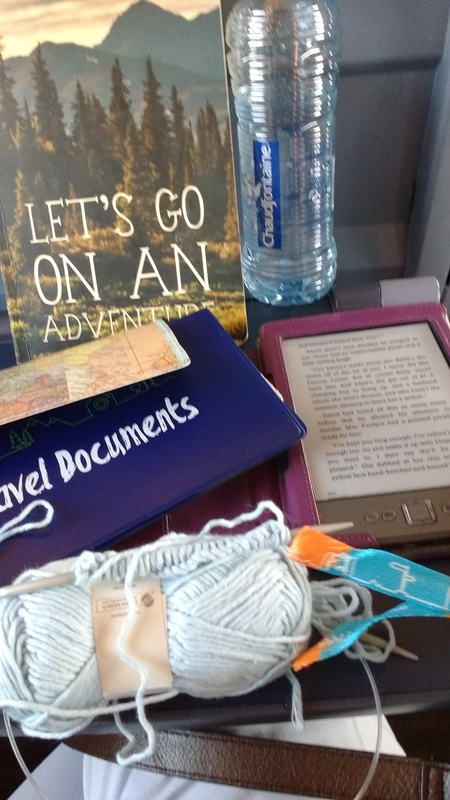 Tomorrow we set off early to become RhineMaydons, heading for Heidleburg. – I obviously look much more decrepit than I feel, as people fall over themselves to offer me a hand lugging my case around. Or perhaps people are just really nice here. Next time, we’ll pack much less stuff. Just the one ball gown. – Kõln Zoo has five baby elephants. Allegedly. All we could see from the top of our bus were cows. – our hosts: a young couple – he a Tunisian dentist, she in IT – had never before made tea. This didn’t stop them offering it, what with us being English- I told you that the people were helpful – and twenty minutes later appeared with a coffee mug of peppermint tea and a cup of icing sugar. Bless.